As Congress debates fixes for the budget deficit and reviews options to grow revenues, provisions in the tax code that have benefited investors are under scrutiny. Tax reform proposals, such as the Bowles-Simpson recommendations, call for a significant scaleback in the use of tax preference items, including many itemized deductions. More recently, plans endorsed by President Obama and Senate Democrats limit the marginal benefit of itemized deductions to taxpayers in the 28% income tax bracket. And lastly, unless a legislative change occurs, the tax provision known as the Pease limitation on itemized deductions will return in 2013. It calls for a gradual phase-out of itemized deductions for taxpayers with adjusted gross income (AGI) above $174,450. 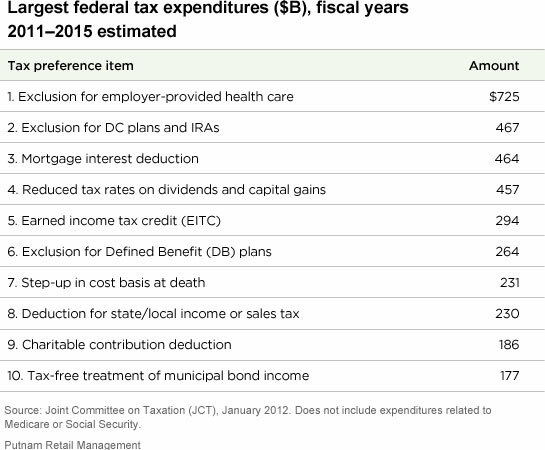 Consider the largest “tax expenditures” identified by the Joint Committee on Taxation (JCT). Given the range of deductions that are under scrutiny, clients should consult with their tax professional and financial advisor to stay current on any legislative changes that may impact their personal tax circumstances. There may be strategies, such as accelerating certain tax deductions, that could be useful in trying to mitigate the impact of higher taxes or limits on deductions.